Lessons for writers from a comic book. The manga (Japanese comics) industry in Japan is wide and varied. There are comic books for all ages, fetishes, and interests. Comics in Japan are read by just about anyone, unlike in America where comics are mostly for kids (or dorks). And many anime (Japanese cartoons), Japanese dramas, and movies had their start from a comic book panel. Japanese comics and animation have become a world-wide phenomenon and even the Japanese government has taken notice and has decided to support this industry (could manga be a form of soft power, for a country to exert its culture and thus create world-wide influence?). I actually lived in Japan for a while and if you go to any bookstore, convenience store, kiosk, or retail store you can find yellow page thick, manga serials readily available for the eager customer. But on to the main topic, or how a comic book from Japan called Bakuman can teach a young writer about writing, publishing, and not giving up. The manga, Bakuman, is a story about two young Japanese boys, one a talented artist, another a gifted writer, who team up together to make comics. Their goal is to create a best selling manga and for their work to become animated. They begin to slack in their studies, but stay in school and go on to graduate from college anyway just to have a back up career, just in case. Surprisingly, the story is fast paced and pretty tense, you cant help but feel pumped when their work wins popularity contests and art awards. There are setbacks and slow periods where it seems nothing is working, but no matter what, they do not give up and find their own style which makes them popular. They aren’t good with mainstream stories, instead they’re really good with dark, twisted worlds, dangerous lead characters, and stories with serious thoughts about society. I haven’t read the end yet but I can expect great things from these two. This comic, consequently, became an anime of its own (there must be a literary term for this). 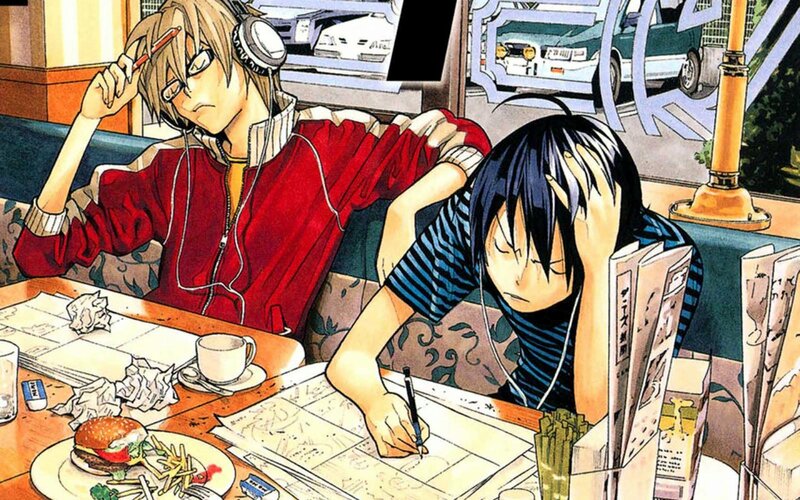 I really enjoyed reading Bakuman: it inspired me to focus on a career while working on my writing and to never give up (too late to turn back now anyhow). Did I mention that Bakuman was made by the same duo that brought you Death Note? Enough said. Hi, I do believe this is an excellent web site. I stumbledupon it 😉 I will come back yet again since i have saved as a favorite it. Money and freedom is the best way to change, may you be rich and continue to help others.